The New York Yankees plan to keep second baseman Rob Refsnyder with the team when second half play resumes on Friday in the Bronx as they take on the Seattle Mariners. The 24 year old made his Major League debut on Saturday night in Fenway in the Yankees’ second game against the rival Boston Red Sox. Although he was hit less in his debut, his defensive skills proved that he was Major League ready as he was fielding ground balls and helped to turn two. In just his second Major League game on Sunday afternoon Refsnyder got his first Major League hit and also his first Major League homerun going 2 for 4 on the day. This showed the Yankees and fans that he has the skills both offensively and defensively to spend time in the Bronx. He also became the first Yankees infielder since 1914 to hit a homerun in one of his first two starts in the Big Leagues. The six foot one infielder, who was raised in Laguna Hills, California, was born in Seoul, South Korea and adopted and moved to the states when he was just five months old. he grew up playing not only baseball but also basketball and football. He was also a football standout in high school as the Quarterback of the Laguna Hills High School team as was actually recruited for football and baseball. He chose to play baseball at the University of Arizona and in his junior season helped the team win the College World Series against the South Carolina Gamecocks. 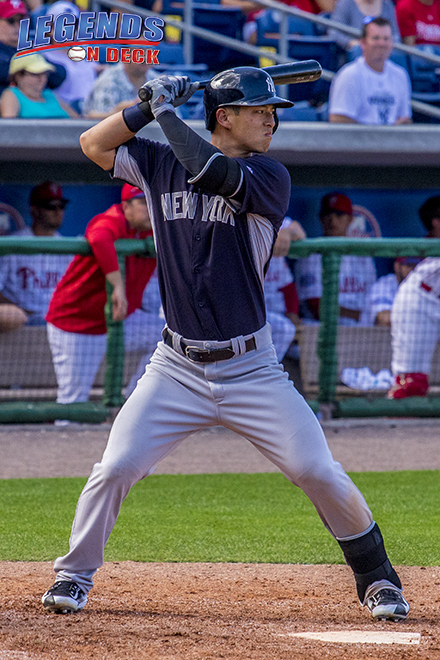 Refsnyder was drafted by the New York Yankees in the 2012 MLB First Year Player Draft in the fifth round. He signed with the Yankees and immediately started playing with the Class-A Charleston RiverDogs in July of 2012. In 2013 he was promoted to Class-A Advanced Tampa Yankees early on in the season where he hit .283 along with six homers and 51 RBIs. 2014 however became the season where the Yankees realized that Refsnyder could be the future of the infield in the Bronx. He impressed at both Double- A Trenton and Triple-A Scranton hitting a combined .318 on the season and was close to making the Major League squad in Spring Training 2015. Before being promoted last weekend, Refsnyder appeared in 81 games where he was hitting .290 along with seven homeruns and 37 RBIs.